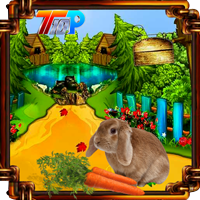 Top10 Rescue The Cute Little Bunny is another point & click escape game developed by Top10NewGames. In this game, you came to know that someone trapped a cute little bunny and locked the animal up in a house. You need to rescue the cute little bunny from there by finding useful objects, hints and by solving puzzles. Click on the objects to interact with and solve puzzles. Good luck and have fun! stuck with a dagger; the paper clue with start leaf tree and owl; and half a board with some letters on it. I can't find the clue for the 4x4 puzzle in the 2nd scene, and I need one more round piece and one more square one. And out! In the scene with the straw hut there is a tricky spot on the tree to the left of the hut.